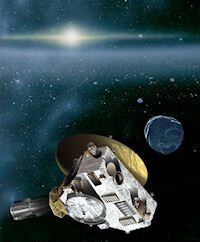 June 18, 2010: Zipping through space at nearly a million miles per day, NASA's New Horizons probe is halfway to Pluto and just woke up for the first time in months to look around. An artist's concept of New Horizons. "Our spacecraft is way out in exotic territory, in the middle of nowhere," says Hal Weaver, New Horizons project scientist at Johns Hopkins University. "And we have a lot to do." It's the perfect opportunity to test New Horizon's instruments before the probe reaches Pluto in 2015. "We don't want to miss a single breathtaking moment during the Pluto encounter," he says. "So we're checking everything out now to make sure we're ship-shape and ready to go." The 9 weeks of testing commenced on May 25th. Mission controllers plan a thorough checkout and recalibration of all seven science instruments onboard. First up is LORRI, the Long-Range Reconnaissance Imager, one of the largest interplanetary telescopes ever flown. "On July 14, 2015, the date of closest approach, we'll be able to distinguish objects on Pluto as small as a football field," says Weaver. "That's about 300 times better resolution than anything we have now." 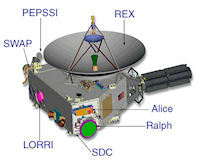 LORRI will be working together with "Ralph," a spectrometer designed to probe the surface of Pluto at visible and infrared wavelengths. Ralph will reveal Pluto's temperature, color, and chemical composition. "During the current tests, we'll point both LORRI and Ralph at something in the sky to make sure they can be operated together with full sensitivity. Since New Horizons is far from any large bodies right now, we'll aim the cameras at a star field to test them." 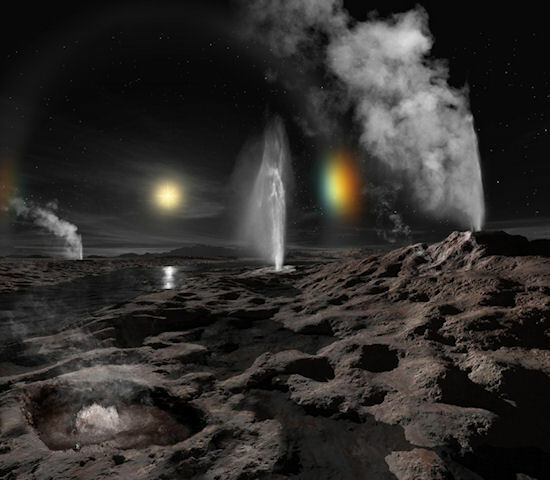 Space artist Ron Miller's concept of hypothetical geysers and sundogs on Pluto. Just after New Horizons passes Pluto in 2015, Pluto will appear as a waning crescent to the spacecraft looking back at it. Weaver speculates that during this phase LORRI might be able to spot hazes high in Pluto's atmosphere or perhaps evidence for cryo-volcanism (i.e., volcanoes that spew icy cold material rather than hot magma) on Pluto's surface. "During a flyby of Neptune in 1989, Voyager 2 spotted dark streaks on Neptune's moon Triton that appear to have been produced by geysers spewing dirty, frozen nitrogen particles. We could see something similar on Pluto." Click here for information about New Horizon's seven main science instruments. As New Horizons passes into Pluto's shadow in 2015, a UV imaging spectrometer named "Alice" will look back toward the sun through Pluto's atmosphere. This should reveal how molecules in Pluto's atmosphere absorb sunlight, and thus what the atmosphere is made of. "We know the sun's extreme brightness can make these activities difficult for our instruments. So we'll set up the same angles during the current testing to determine what we'll really be able to see and what kinds of information can be pulled out." Cameras and spectrometers won't be the only busy instruments. REX, New Horizon's Radio Science EXperiment, will detect and observe radio signals coming all the way from NASA's Deep Space Network on Earth. "The way those signals bend as they pass through Pluto's atmosphere will tell us a lot about the atmosphere's pressure and thickness." The team is counting on test results to be "all systems go." If everything checks out, there's a lot to look forward to. "We have high hopes for this mission," concludes Weaver. "Pluto awaits. The most exciting thing is that we don't know what we're going to see when we get there."